An electrical issue, though specifics are yet to be determined, is the cause of a March 23 bus fire on NYS Route 96, near Krums Corner, TCAT General Manager Scot Vanderpool said recently. There were no injuries thanks to the quick reaction of TCAT Bus Operator Antoinette Briggs, Vanderpool said. TCAT has been working closely with the New York State Department of Transportation and the Albany-based Public Transportation Safety Board to investigate the fire’s cause. In addition, Vanderpool said, TCAT’s maintenance crew is ensuring all TCAT buses are safe. The bus, built in 2011, was severely damaged and will be scrapped. TCAT recently put 11 new buses into service. 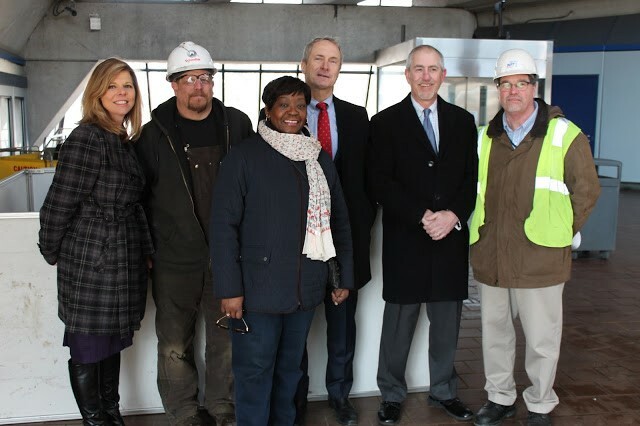 On April 2, New York State Assembly members Crystal Peoples-Stokes, Sean Ryan and Monica Wallace along with members of NFTA's leadership team came together at the Delevan/Canisius Metro Rail Station in downtown Buffalo. The delegation members were on site to announce a $9 Million capital grant through the New York State Department of Transportation for improvements to the NFTA's light rail system. The timely funding comes amid significant deterioration through the Metro Rail system, which accounts for 90 percent of the NFTA's capital dollars. Issues stem from the fact that there is no dedicated state funding line for the light rail system, as current STOA and capital funding only account for bus service at all upstate transit authorities. Assembly Speaker Carl Heastie, Transportation Chair David Gantt and Corporations, Authorities and Commissions Chair Amy Paulin today announced that the enacted State Fiscal Year 2018-19 budget invests $10.2 billion in the state's transportation network. New measures will address current and future capital needs at the Metropolitan Transportation Authority (MTA) by establishing dedicated a revenue stream to prioritize the safety and service reliability of the subway system and to improve access to mass transit in the outer boroughs. "This budget recognizes that New York has one of the hardest working transportation networks in the world," said Heastie. "The investments in this plan will not only provide for immediate improvements to service and reliability, it will ensure a fiscally responsible path forward for future capital needs." "With this budget we consider the present and long-term needs of the state's transportation systems but also ways to reduce congestion and improve performance across the board," said Gantt. "Ensuring the safety of the motoring and commuting public remains among our top priorities." Natasha Gasich is a first grade teacher at Genevieve Melody STEM (Science, Technology, Engineering and Mathematics) Elementary School, a public grade school in the West Garfield Park area of Chicago. According to Gasich, nearly all of her students either take the train to school or on weekends, despite their young ages. Out of a total of approximately 1.6 million weekday train and bus riders, 135,000 — nearly one in 10 — are school-age children, according to the Chicago Transit Authority (CTA). Of those 135,000 student riders, the vast majority, about 107,000, ride city buses. The remainder ride the “L”, (the local term for Chicago’s elevated and subway train system). The new app for the Milwaukee County Transit System has everything to get you from here to there on the bus: trip planning, real-time mapping and ticket purchase. The guys behind the app, Glendale-based Tixora LLC, think it's the best transit and ticketing app out there. "There are other apps that have tried to do that in the past — trip planner, mapping, mobile ticketing," said co-founder Aaron Redlich. "But they end up with a clunky result." The app, Ride MCTS, is available for free download. The iOS version of the application rolled out in November. The Android version launched last week.